Photographers and Video Creators have seen the improvement of audience engagement, time and time again by simply enhancing their studio lighting through high-grade photography lighting equipment. The Diva Ring Light will improve the overall appearance of a photo or video's subject by enhancing facial features and highlighting eyes. Multiple lights can be used on a set, even in compact spaces, to professionally brighten a stage and add depth to the background and eliminate flat, shallow looking sets. 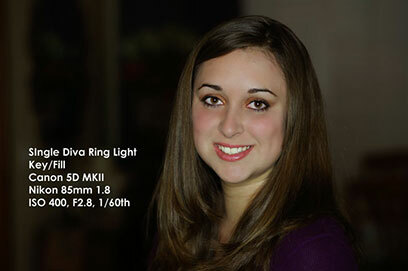 The Diva Ring Light is the ideal light for video blogging, portrait photography and creative music videos. 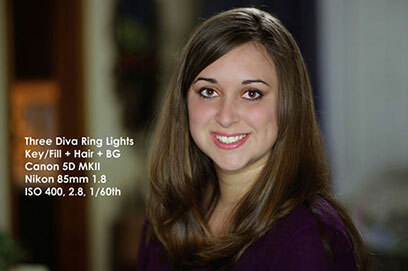 The Diva Ring Light Nova comes with the 5,400K Daylight bulb. This is the perfect temperature for making an indoor set look bright and sunny- even at night. A mount for a stand and a tripod is included so you can attach it right onto your camera’s tripod for a direct projection, or on its own stand for alternative lighting. Also included is an adjustable “gooseneck” mount for different angles and positioning. 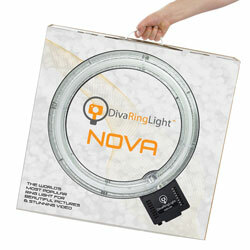 The Diva Ring Light comes in an attractive durable and travel-friendly box that can be reused and kept for storage. Looking for this light with even more features? Check out the dimmable Diva Ring Light SuperNova. International customers outside of North America requiring a 240V compatible light, be sure to check the appropriate checkbox on this page before adding to cart. If your background is in still photography, videography or filmmaking, you have undoubtedly seen and taken notice of the results from using ring lights. From Hype Williams' visually groundbreaking late '90s music video work to high fashion, beauty and glamour photography, the beauty ring light is the weapon of choice for image-makers who want to show faces in the most flattering light possible. 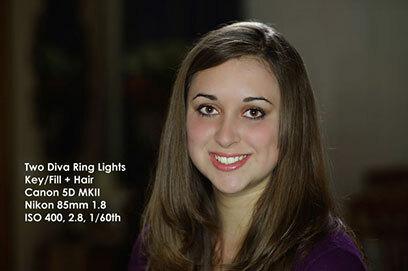 The beauty ring light gives the image a distinctly clean, soft and modern look. What exactly. While mounting a key light to the lens sounds like an obvious location, placing the light source directly on-axis with the lens also accomplishes a couple of important effects. The main result is a light source that is quite flat because it is generated on an identical axis to the camera's lens. The benefit of this sort of flat, soft lighting is the elimination of almost all skin imperfections, makeup colors pop and the face ends up having a fresh, clean look. 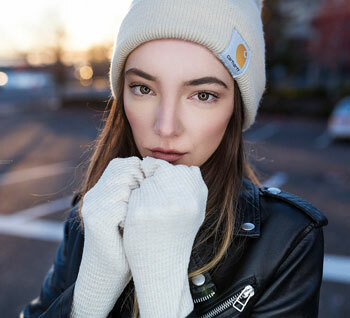 A secondary benefit of the ring light is that the catch lights in the eyes of the subject, the small reflections that give the eyes that "sparkle", are enhanced to give a distinct, stylized look to the image. The Diva Ring Light Nova is a new product that breaks down the cost barrier of adding a fairly large and soft ring light to your lighting package. Currently retailing for the heretofore unheard of price of $199.00 at DVeStore with replacement tubes available for a mere $26.00, the Diva Ring Light seems to be poised to allow the ever expanding audience of DSLR and prosumer video camera users to obtain the unique ring light signature look. Until now, a ring light has been out of reach for many users who could not afford to purchase or rent one or construct one. While you could build your own ring light, between researching the parts you will use, locating and buying the parts, prepping and assembling the light and testing it, unless your time is worth very little, you won't be able to create a ring light for less than you can buy this one for. 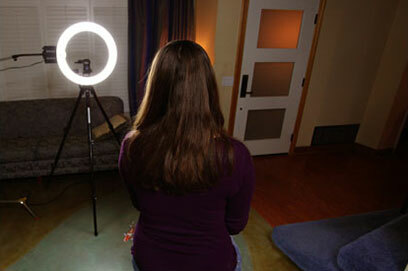 Because the beauty ring light is a somewhat specialized piece of equipment, the result is a relatively high retail cost. Many ring lights on the market are only six or eight inches in diameter, resulting in a smaller light source, making the quality of the light harder than a larger fixture would provide. 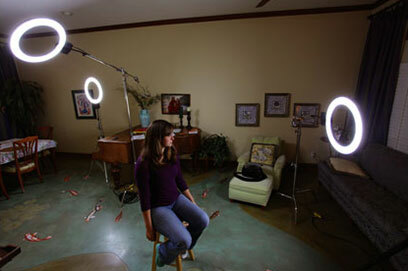 Larger diameter ring lights have typically cost several thousand dollars. For such a low cost, just how well does the Diva Ring Light work? There has to be a catch, right? Guy Cochran of DVcreators sent me three of the new Diva Ring Lights in order to see in how many different ways I could utilize the photography lighting equipment at my disposal. Before trying to tackle how to best utilize three ring lights in a setup, I first decided to put a single light through its paces. After positioning my camera, I rigged the Diva up to the end the grip arm on a 40" C-stand. This allowed me to position the Diva light wherever I needed to put it. I placed the light and camera approximately 6' from my subject. I shot still images using a Canon 5D MKII, one of the most popular DSLRs. The Diva Ring Light Nova is rated at 65 watts of output but keep in mind, 65 watts of fluorescent output, because fluorescent lights are more efficient than tungsten, is equal to about 250 to 300 watts of tungsten output. Another factor to consider in distances from light to subject are that the Diva does not have a dimmer function as some fluorescent fixtures have so the only way to regulate the output of the Diva is by changing the distance from the subject. You cannot easily put diffusion in front of a ring light without changing the specularity, directionality and the ring light effect. Since I had three of the Diva Ring Lights to play with, I decided to try using all three in a traditional interview lighting setup. Normally, ring lights are used only on-axis with the camera, but I discovered that it all depends on how you view the Diva Ring Light. If you view the Diva as a soft, fluorescent light source, and not as only a ring light, what can be accomplished in a typical interview lighting setup? Typically, to light an interview, I would use a key source, a fill source and a hair or rim light to separate the subject from the background. This image is lit with only a single Diva Ring Light. Note that while the subject is flatly lit, the image still looks a bit "incomplete". Here is sample lit with two of the ring lights, one as a key/fill source from the front of the subject and a second ring light, mounted on a 40" C-stand arm raised up above and about four feet behind the subject. The next image shows the same setup with the addition of the third ring light to light up the background of the room. When you consider that most 3-4 light kits sell for between $1,000.00 to $3,000.00, to be able to achieve this level and quality of light for less than $600 is quite impressive. 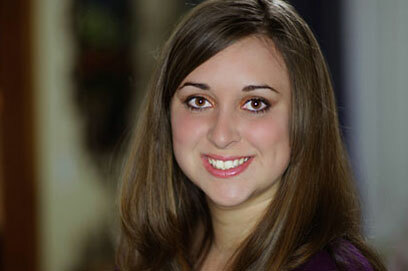 The three light ring light setup provides a clean, high-key look. You should be aware that because the Diva Ring Light is not dimmable, some subjects might find the light around the lens to be quite bright. This "wow, that light is too bright!" effect is commensurate with the amount of ambient light in the room. If you are in a dark room and are lighting solely with a Diva Ring Light, which is a high contrast situation, some talent may feel that the ring light is too bright. I noticed in this setup, once I added the hair light overhead and behind the talent, the apparent brightness of the key light was reduced significantly and even more once I added the third light to the background. 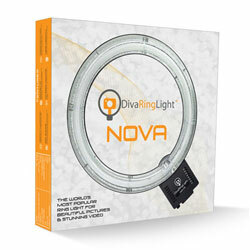 Be sure to also check out the new Diva Ring Light Super Nova and all our photography lighting equipment at DVEStore. What are the main differences between the Nova and Super Nova? The Nova and Super Nova share the same body. The Super Nova is dimmable and comes with a diffusion cloth. Dimming capability allows for finer control of exposure and the diffusion cloth softens the light. What comes with my Diva Ring Light? Both the Nova and Super Nova ship with a 5400k Bulb, Light Stand Mount, and Tripod Mount. The Super Nova also includes a diffusion cloth and dimming feature; where the Nova does not. 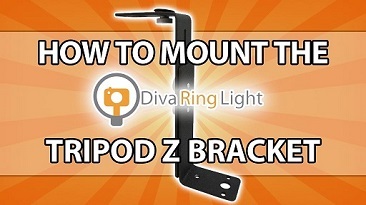 Do I need to purchase anything in addition when ordering a Diva Ring Light? Perhaps, while the lights come with mounting hardware, they do NOT ship with any support. You will need to provide either a light stand or tripod. We recommend using light stands with a wide leg base for stability, and a tripod that has a load capacity to hold your camera and the ring light. At it's full brightness, the ring lights puts out 4500 lumins. What is the difference between a Light Stand and a Tripod? A light stand is a stand with tripod legs at the base that is designed to hold lights, where as a tripod is a 3-legged stand with a head for holding cameras. Depending on use, you should be able to get 1,000 hours of use out of every bulb. 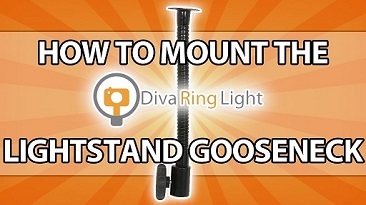 How do I mount my Diva Ring Light onto my Light Stand/Tripod?